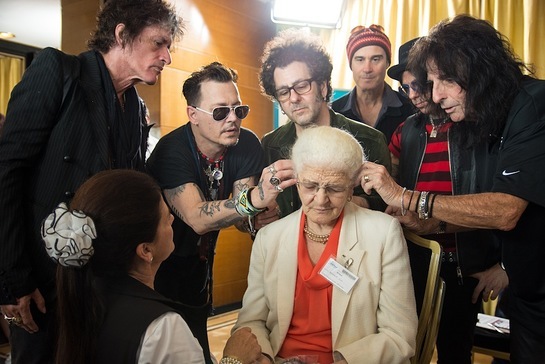 Starkey Hearing Foundation welcomed Hollywood Vampires prior to their Rock in Rio Lisboa concert to a hearing health care mission to meet and inspire 30 patients in Lisbon, Portugal. The band first supported a hearing mission in Rio de Janeiro where they witnessed people hearing for the first time. Because of that meaningful experience, they wanted to help patients at another mission. Giving a person the ability to hear has an immediate inspiring impact on that person’s quality of life and a compounding positive effect on the world. Hearing empowers people to reach their full potential and creates a future filled with possibilities. Many were able to hear for the first time, to experience the joy of music and to live more independently as a result of their new found connection to the world. “When you come to do these big concerts, you think that the concert is going to be the high point of the trip, but it isn’t, this is. The mission was the high point because these people are hearing for the first time. That’s amazing that hearing is going to last the rest of their life,” said Alice Cooper. Starkey Hearing Foundation with their partner, GAES Solidaria, provided hearing devices as well as counseling and training to patients and family members on how to care and operate their hearing device. “It was another good day of people coming together to discover our humanity through caring. 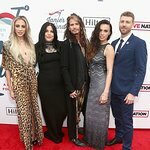 We had another great adventure with the Hollywood Vampires, and we appreciate their support,” said Bill Austin, founder, Starkey Hearing Foundation.